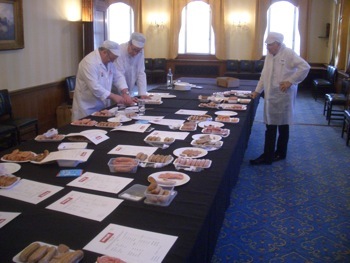 Calling all sausage makers: Devon County Show competition! This competition is to find the most delicious and attractive sausage, therefore a greater emphasis will be given to the taste and appearance of the sausage, rather than technical marks for construction. Across the country, Q Guild butchers are sharpening their knives with zeal as the winners of seven regional category heats get fired up to compete in a national event to find Britain’s BBQ champion. Pulled pork sausages are the latest innovation from The Black Farmer, following a Facebook poll to determine its next new flavour. This review has been a little while coming because I’m a massive fan of Newmarket sausages and I wanted to savour all of the varieties that Powters have to offer. Are you struggling to find the perfect gift this Christmas? I have the answer – bacon jam! Infact bacon jam is the answer to most questions. My local Co-Op, the East of England Co-Op, have made great efforts over the past few years to source from as many local suppliers as possible. I went to check out the local produce at my local store. A butcher from Norfolk has landed leading honours in the 2015 Butchers Q Guild Smithfield Awards, the annual product evaluation event, open to the Guild’s 110 members nationwide. A BUTCHER has won an award for making the most “innovative” sausage in East Anglia.